Road Rash was a fundamentally ridiculous game about hyper-violent motorcycle races in which victory could be achieved either by being faster than your opponents, or by pushing them into oncoming traffic at 120 miles per hour. That's a good description of Road Redemption too, a "spiritual successor" that blasted through Kickstarter and Steam Greenlight last year, and is now available on Steam Early Access. If anything, Road Redemption is even more violent than Road Rash, which as I recall had neither automatic weapons nor tumbling, exploding cars. But I do very much recall cackling like a fool every time an opponent ran headlong into an American-made sedan and got launched into the stratosphere for his trouble. 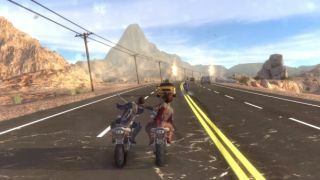 As you can see from this new trailer, Road Redemption is loaded with all kinds of that silliness, and more. There are a number of significant differences, however. If you crash out in Road Redemption, you won't just dust yourself off and get back on the road, because you'll be dead. Money collected during races can be used to upgrade your character, your weapons and your bike, and there's even a bit of a story, too, although I'm guessing it won't keep you on the edge of your seat in anticipation of the next exciting chapter in the tale. Developer Dark Seas Interactive describe the Road Redemption Early Access release as a "10-15 hour experience," and says that it's already been extensively playtested and bug-tested. It's currently being offered at a ten percent discount off the $20 Early Access price tag, which the studio says will go up to $30 or $35 at launch, currently scheduled for early 2015. If you want it, in other words, now's the time to get it .